This was not my first visit to the Orkney Islands. Back in 2009 we spent a week there as a family in a self catering apartment in Kirkwall. Orkney is a group of 70 islands located 10 miles north of the coast of mainland Scotland so to get there you have two options. Air or Sea. For our family trip we sailed from Aberdeen with Northlink Ferries (have a read about my trip with them to Shetland - the same vessel stops off in Orkney enroute) however for my press trip I flew from Aberdeen Airport. The flight takes 55 minutes and is operated by Loganair. Unfortunately my outward journey suffered from an almost 2 hour delay. Thankfully I spent it in the Northern Lights Executive Lounge. Thanks to Holiday Extras for hooking me up with that and my airport parking. The decent into Orkney is a magical experience in itself as the islands start to appear below you. The landscape is very green, rolling and lush with a distinct absence of trees. Whilst I'd come prepared for any weather some participants on the trip were caught unawares by just how wild and windy the climate can be in the far north of Scotland. However the adage very much holds true that if you don't like the weather wait 5 minutes as it will have changed. We kicked off the visit with a half day whistle stop tour of some of the main tourist attractions. Our guide was the lovely Lizzie (Lizzie's Orkney Tours) who was an absolute font of knowledge. The island has a phenomenal Neolithic past and we really just scratched the surface with short visits to the Standing Stones of Stenness, Skara Brae and the Italian Chapel and a drive by via the Ring of Broadgar, Churchill Barriers and Maes Howe. A lunchtime showcase introduced us to the sheer variety of Orcadian food and drink. Everything from seafood to ice cream and beremeal bannocks to beer. My absolute favourites were the smoked olives and smoked mussels from Humes. Unfortunately not available to buy outwith Orkney as yet. All washed down with Rhubarb Old Tom Gin and Ginger Ale. Alas there was no time to visit all the producers and choices had to be made. First decision was whisky based - Highland Park or Scapa. After some twitter chat with some of my whisky aficionado friends I opted for Highland Park. I was delighted to discover that the barley used in making Highland Park, like me, hails from The Black Isle. I'm sure it makes the whisky taste all the sweeter! A short film about Orkney, Highland Park and it's Viking roots was the perfect introduction prior to a tour of the working distillery. Highland Park is one of only a handful of distilleries to still retain a traditional malting floor, turning each batch of malt by hand. We all had the opportunity to pick up a shovel and give it a try. I can see why you'd end up with Monkey Shoulder! Next we viewed the aromatic peating process with local heather based peats from Hobister moor providing the characteristic flavour. The stills room, warehouse and an explanation (and sniff) of sherry casks led us back to the visitor centre where we finished off with a tasting session. Sláinte! We all know how much I love Gin so the visit to Kirkjuvagr Gin was always going to be a highlight. Based in a newly built Distillery and Visitor Centre right in the centre of Kirkwall they are one of three Gin producers on the island. In the interest of research I also sampled drinks from both Orkney Gin Company and Sea Glass Gin during my trip. Situated at the front of the distillery and visitor centre is a gorgeous coffee, gin bar and shop with views across the busy harbour. A fab range of merchandise is available including the fantastic Orkney Gin Fudge. From the cocktail menu I can highly recommend the Espresso Martini. The tour kicks off with a short film before heading through to the production area to learn about the distilling process and the key botanicals. Tasting takes place upstairs where we sampled the full range of gins from Storm Strength to Harpa. I'll be honest as say that I really didn't want to leave and could have happily wiled away the whole evening in the bar. A great new addition to Kirkwall which is sure to be well supported by locals and visitors alike. The only thing that could lure me from Kirkjuvagr was the promise of dinner at one of the best dining experiences that Orkney has to offer. The Foveran is a restaurant with rooms 3 miles outside Kirkwall with spectacular views over Scapa Flow. Based on the decor in the dining and public rooms this is somewhere I would love to return to for an overnight stay. The menu and whole ethos of the The Foveran reflected what Orkney does best. Local and seasonal produce including shellfish, lamb, beremeal, whisky, Orkney fudge, cheese, oatcakes and ice cream. Sublime food, service and surroundings from start to finish. If I was asked to name an Orcadian food product the first one that would come to mind would be Orkney Cheese - clue is in the name! On my previous visit to Orkney we popped in past and it it was a non production day. What's the chance of lightening striking twice? Fairly high it would seem! Although I've yet to see it being made but I've tasted it on many occasions and regularly buy it at the supermarket. Following an influx of over 60,000 service personal and prisoners of war to the Islands in WWII dairy production increased to meet demand. After the war there was a surplus of milk and a co-operative was formed to manufacture cheese. The multi award winning cheese continues to be produced with only Orcadian milk from the cattle who graze on the islands green pastures. A special treat only available in Orkney is their butter. Worth popping in past the creamy to buy some even on a non production day. Following on from Whisky and Gin it was time to sample some Orkney Beer. For this we headed to Swannay Brewery located on the northwesterly tip of Orkney’s mainland in a former dairy farm. The mainstay of production by father and son team is Scapa Special pale ale which accounts for around a third of all that they brew. Their award winning range of products includes traditional perfectly balanced ales through to contemporary and innovative modern brews - with packaging to match. A small onsite shop sells their products and merchandise and you'll find it available on tap across the Island. Beeson on Beer was also on our press trip and you can read James's interview In Conversation with Rob and Leiws Hill for a much more in depth insight into Swannay Brewery. Barony Mill in Birsay is somewhere that has long since been on my foodie bucket list having a well deserved entry in the UK Ark of Taste. It really is one of a kind producing beremeal which is a type of flour milled from an ancient form of barley. 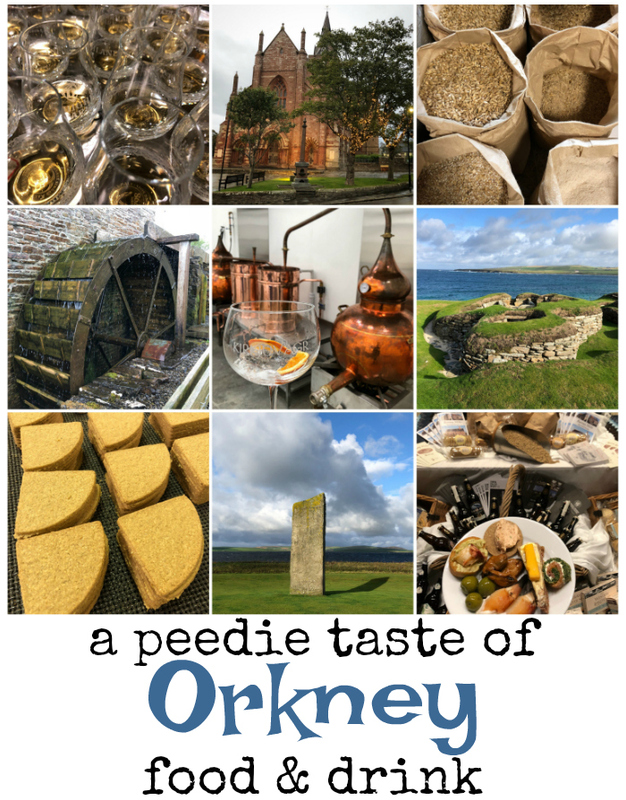 Bere has been grown in Orkney for thousands of years, both for human and animal food. It's a six row barley which is perfectly suited to Orkney as it only requires a short growing season. Barony Mill is the only working water wheel in Orkney and the only one in the world milling bere. Milling is undertaken over the winter and in the summer the mill is open to visitors. It's a realy working place of history and the tour is fascinating especially when the water is turned on and everything kicks into action. The visit to Barony mill really pulled together all of the food we had eaten and producers that we had visited elsewhere on the Island. It has been found in the middens (rubbish tips) at Skara Brae and throughout our trip we ate it in Bere Bannocks, Bermeal Oatcakes, shortbread and biscuits and drank it in Scapa Bere beer. Tours are free but please pop a donation in the box and keep your eyes peeled for the mill cat and mice. One of the best things about my job is getting to go behind the scenes and see how things are made. It's like when they used to take you through the round window in Playschool - only better! The tours that we did at all of the other producers can be readily booked and undertaken by all visitors to the islands but at Stockans Oatcakes it was a proper inside the factory tour complete with hairnets, gloves and overalls. Always an attractive look! I'm a big fan of oatcakes, traditionally with Stovies or Scotch Broth but more recently with hipster toppings of smashed avocado or nut butter. I'm a thick oatcakes girl but production on the day of our visit was thin triangles. Based in Stromness, Stockans have been baking Orkney oatcakes for over 100 years. They are sold throughout the world and are stocked by all the major UK supermarkets. It was fascinating to see the whole process which although has some elements of mechanisation also requires a lot of skill and dexterity from the staff. Jobs are rotated frequently throughout the day and any damaged oatcakes become chicken food. The oatcakes are pressed out using large biscuit die cutters before being baked, cooled, stacked and packaged. I'd definitely have to up my speed to get a job in the factory! For me, much of what is best about a press trip only happens when I head home and reflect on what I've learnt and discovered. I always return with a stash of foodie goodies as souvenirs which help to prolong the experience. Admittedly some items were devoured pretty much as soon as I got home - Orkney fudge, Beremeal biscuits and the Oatcakes and Cheese not even lasting until the weekend! Kirkjuvagr has made itself at home on my gin shelf and I've been baking Beremeal Pumpkin Bread. Having visited and loved my time in an area I tend to then become an 'unofficial ambassador'. As such you are likely to find me shouting from the rooftops about all things Orcadian from this day forwards. There are many reasons for me to return to Orkney but the most pressing one is a Pattie Supper. This is one from my foodie bucket list that I didn't manage to tick off. To be fair I only learnt about it whilst on this trip and I did try to procure one on two occasions but timings conspired against me. But what is this Orcadian delicacy? None other than deep fried battered mince and tatties - with each place having their own secret recipe. Surely the stuff that legends are made of! Sold in all the island chippers as a single or a supper and also available to purchase in the local frozen food emporium. Definitely the number one thing to do on my next trip. If you're visiting in the interim please have one for me. Disclosure: I visited Orkney as a guest of the Orkney Marketing programme. As always, all views expressed are my own. Looks like you had an amazing trip! I've been eating those oatcakes for a while and silly me didn't realise they were from Orkney hahaha. I wouldn't think the islands were known for their food and beverage options, but you've certainly opened my eyes. Some great places I'll have to try when I plan my island holidays for next year. Orkney has been on my bucket list for so long - more for the nature than the food, but you've changed that now! I'll definitely make sure to visit all these distilleries when I'm there!! Thanks for sharing!